Techcrunch founder Michael Arrington is making more than $60,000 in ad revenue every month but one of their co-editors at Techcrunch France quit the job because Michael was not paying him any money. Guillaume Belfiore was responsible for translating Michael Arrington’s articles on Techcrunch.com from English to French for the TechCrunch French website. Techcrunch France does have Adsense or other graphic ads as well, with a huge trafic; however I did not get one cent for the translations I have made. Were they expecting an endless benevolence? No way, I’m being realistic! Business 2.0 story [Blogging for Dollars] says that Techcrunch expenses are about 12 percent of revenue and occasionally there are bonuses. So who's enjoying them ? Not the Techncrunch translators. 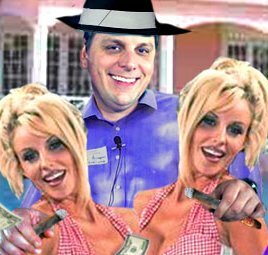 Update: Valleywag has done some hilarious photoshopping of the Business 2.0 magazine cover picturing Fark.com owner Drew Curtis surrounded by falling cash and TechCrunch blogger Michael Arrington with cigar in both hands and female fans.